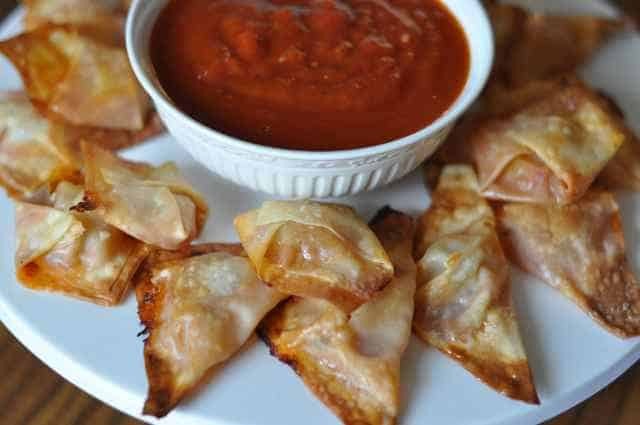 Pizza Won Tons are a fun appetizer if you like won tons, this recipe is for you. These crispy wontons are baked in the oven, so if you don’t want to whip out the deep fryer, this is the recipe that you want to prepare. These Crispy Fried Wonton Pizza Bites were originally posted by Kate on her Blog If You Can Make That You Can Make This. Super Bowl – another of those fantastic eating holidays that we missed out on for years through ignorance and being British. We first discovered the party when we were living in Warsaw Poland. Some ex-pat American friends invited us to join them at a local sports bar at 1 in the morning to eat burgers and watch the game. It was the most riotously joyful midnight feast I’ve ever been to. Plus I won $50 by picking a random name in the first touchdown sweepstakes. Burgers, beer and betting when we ought to be tucked up in bed? For a girl who was brought up Methodist, it was all too seductive for words. These wonton pizza bites taste fried but are baked, which keeps the kitchen smelling good, and makes life much easier if you’re feeding a crowd. They can be made a day or two in advance and heated up on Game Night. Crispily fried wonton pizza bites are a great appetizer you have got to try. Repeat for the rest of the wontons Brush both sides of each wonton with vegetable oil and place on a baking tray. Bake for about 10 minutes until the parcels are golden and crispy – keep an eye on them – I bought a packet of wontons recently that took 17 minutes to cook up, and conversely, a different packet took 8. It depends on the wonton and the reliable-ness of your oven. Season with salt and pepper then serve. They look good and it’s great to have them baked for a change. I’ll have to give this a try — always have a packet of wonton wrappers in my freezer.